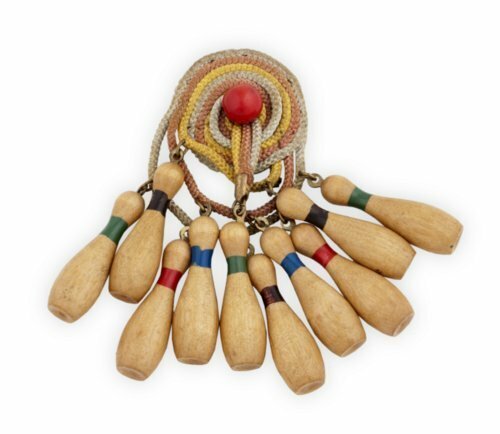 Costume jewelry brooch featuring a braid-wrapped ball with dangling bowling pins. Ball is formed of pale pink/green/yellow braid wrapped in concentric circles and stitched to front of clear plastic disk with a single red wooden bead. Some braid loops hang past the disk's bottom, and dangling on these loops are ten wooden bowling pins. Pin necks are painted with green, red, blue, or purple bands.